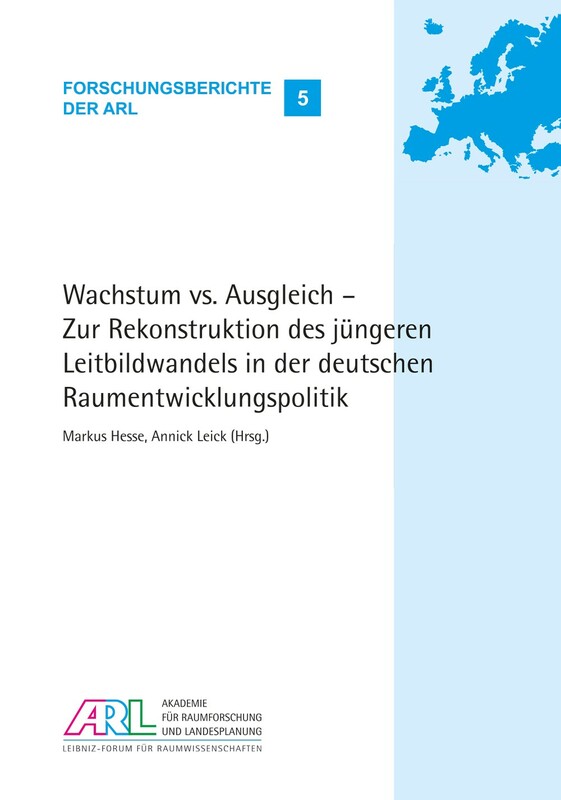 Die „Neuen Leitbilder und Handlungsstrategien der Raumentwicklung in Deutschland“ wurden Anfang der 2000er Jahre entworfen und 2006 von der Ministerkonferenz für Raumordnung (MKRO) als offizielle Leitlinie der deutschen Raumordnungspolitik verabschiedet. Sie wurden begründet mit der notwendigen Anpassung der Raumordnungspolitik an veränderte sozio-ökonomische und politische Rahmenbedingungen, vor allem mit einem veränderten Wettbewerbsumfeld für Städte und Stadtregionen. Das Leitbild 1 und darin das Konzept der Metropolregionen haben in diesem Prozess die mit Abstand größte Resonanz erfahren. Metropolregionen galten als Ankerpunkte der Globalisierung, als Motoren wirtschaftlichen Wachstums und Mittelpunkte einer zukunftsfähigen Raumentwicklung, sowohl national wie regional. The “New Guiding Principles and Action Strategies of Spatial Development in Germany” were drawn up at the beginning of the 2000s and passed by the Conference of Ministers for Spatial Planning as the official guidelines of German spatial policy in 2006. They were justified by the necessity to adapt spatial policy to the changed socio-ecological and political framework conditions, especially the changed competitive environment for cities and urban regions. In this process, by far the greatest response was caused by Guiding Principle 1 and the concept of metropolitan regions it outlines. Metropolitan regions were considered as anchor points of globalisation, as engines of economic growth and as the focus of sustainable spatial development, both in national and in regional terms. This publication documents a research project commissioned by the ARL, which was conducted between 2011 and 2012. It aimed to reconstruct and to critically scrutinise the transformation of guiding principles towards promoting growth-oriented spatial planning policies with a focus on metropolitan regions. Both objects – the new guiding principles of spatial development and the concept of metropolitan regions – were investigated from the perspective of discourse analysis. This involved analysing the thematic reorientation in terms of language practices and communicative constructions, taking into account the ideological contexts in which policies are formulated or “framed”. The focus of interest is thus on the context of justification for this change of policy and not on an ex-post analysis of its effectiveness. Ultimately, the concept of the new guiding principles and the “politically designated” metropolitan regions are judged to be theoretically inconsistent, empirically ambiguous and conceptually fragile. The essentially growth-centred objective is perceived as one-sided. Consequently, a more strongly diversified discussion of future guiding principles and strategies is indicated. These deliberations are to be understood as a contribution towards further developing the guiding principles, theories and thus selfconception of spatial planning.